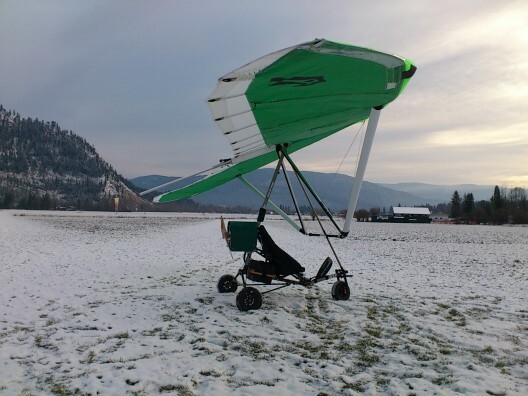 John McClintock and Randy Rauck have been developing an electrically-powered hang-glider “trike” for the last year, and Saturday, December 8, Rauck took their Green1 battery-powered hang-glider skyward – Canada’s first electric flight. Taking off at approximately 10:00 a. m., Rauck flew a smooth circuit of the Pitt Meadows airport, southwest of Vancouver, B. C. The pair have been bench and ground testing their Electravia motor, controller and battery pack as part of their creation of eUP, a firm dedicated to making electric flight possible in ultralight aircraft. Rauck and McClintock, both licensed private pilots with 35-year aviation backgrounds, were motivated to “create an affordable, fun, environmentally-friendly aircraft with a clean, smooth and quiet flight experience. The YouTube video shows that they accomplished their objectives, with a very quiet, smooth turn around Pitt Meadows. They look forward to soaring their creation, a combination of North Wing trike and a Solairus 17 wing chosen for its good sink rate and portability. They used Electravia’s GMPE 102 motor, an E-Prop, and a proven set of components, including Electravia’s 53-Amp-hour (4 kilowatt-hour) Kokam battery pack. eUP announces that it will be named the North American distributor for Electravia products, broadening the market for Anne Lavrand’s products and probably helping develop new platforms for electric flight. Seeking to overcome that, the partners are looking at the Atos hang-glider, a high-aspect ratio wing with excellent soaring capabilities, “two excellent-looking trikes that have recently emerged from the testing phase,” powered paraglider trikes, and possible conversion of a Moni they have in the yard. John says it’s, “Not a very original idea,” but looks forward to learning from it. Even a two-seater is possible in the future. For the near future, though, “Randy will be in charge of sales and marketing while I continue with product development.” We wish them luck.